GORDONVILLE — My maternal grandfather – i.e. Poppy – was among an interesting ensemble cast of characters than made up the first act of comedy-drama that is my life. Born in 1900, it was always easy to mark history by his life. When the stock market crashed in 1929, he was 29. When Pearl Harbor was attacked in 1941, he was 41. When I was born in 1965, he was 65. In a time when non-WASPs were put on quotas at most colleges of distinction, he rose above the intolerance. He went to the University of Pennsylvania and Jefferson Medical School, becoming a physician. He served his country during the back end of World War I and, as a doctor, volunteered to give physicals for the draft board during World War II (he even received a letter of commendation from FDR). An avid reader, Poppy’s mind was like a steel trap on a variety of subjects. He loved sports, watching game after game on the tube, and music. He played every string instrument created, with the violin being his specialty. And, like most people, he was a dichotomy. Even at a young age, I found zero humor in silliness and slapstick, but this man of more education than the rest of the family put together responded to it. In the late 1970s, I had already outgrown “Happy Days.” It was the show where the term “jump the shark” originated, and it had done that for me. It ran from 1978 to 1982 — meaning 13-17 for me and 78-82 for Poppy — and I tried humoring him and watching it, I really did. But, to be kind, we’ll say it didn’t float my boat. At that age, I was either watching hockey or playing hockey. I remember my school mates talking about it, but I tuned them out. I had been there, done that and didn’t want to go back. So, while that show introduced many of my generation to its star, Robin Williams, I was off to a late and shaky start with the guy playing Mork. By 1984, when Poppy was 84, the CE (Cute Era) had commenced for me. Girls would go the movies with me and I caught “Moscow On The Hudson” on a date. The girl said Williams kind of reminded her of me, which I wasn’t sure how to take at the time. It may have had something to do with him being so hairy, as I didn’t speak with a Russian accent. Beyond that assessment, which I have since come to realize was a major compliment – even if not intended – I was coming around. He made his share of middling movies in the 1980s, but two more – “Good Morning, Vietnam” (1987) and “Dead Poets Society” (1989) – cemented him in Gordonville as a talent who can make you both laugh and cry with nuanced facial expressions or gestures. He was the ultimate sad clown of my generation, matching Charlie Chaplin of Poppy’s era, but there was a more daring side. He had an edge to his game. I also caught some of his HBO specials and, in addition to laughing at humor that would not have been Poppy’s style, appreciated the all-important underlying social commentary. I consider that movie a modern classic, one that should be required viewing for young adult males looking to find their place in the world they are about to enter. It would have been a good movie without Williams, but it was his spin on the role — often improvising on the script of Ben Affleck and Matt Damon – that made it great (and I rarely use that overused word). He won an Oscar for best supporting actor. And won my heart by touching my soul. Poppy left us three years earlier, and likely would not have believed that it was Mork from wherever up on the big screen. 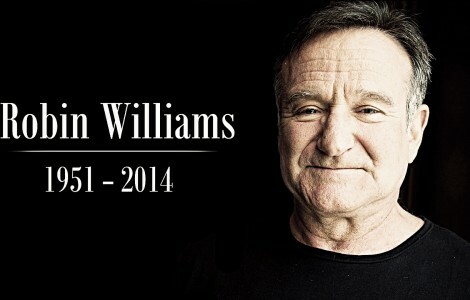 He also would have had a hard time understanding that Williams, at age 63, succumbed to depression and took his own life (We are now hearing that a recent diagnosis of Parkinson’s disease may have factored in.). It is hard for all us to believe, but we are not in his shoes. All that made Williams who he was to the world is what proved to be what haunted him. He felt too deeply. He felt a need to laugh and cry at one time, perhaps not knowing which emotion would win out, and was able to get us to do it as well. All we can do now is enjoy the body of work – whether it is “Mork and Mindy” or some of my personal favorites (“What Dreams May Come” and “The Fisher King”) or one of the new movies that will be released posthumously – that he leaves behind. All of it is not for all us, but most of it is for most of us. And instead of pounding our judge’s gavels about how his life ended, let’s focus on how he brought life to his alter egos. If I could talk to him now, I would thank him for making Poppy laugh through his grief during the years when my beloved grandmother — and Sofia’s namesake — died suddenly of stroke. If I had to repeat it, like he did to Will Hunting, I would. And if he needed a hug, I’d give him one. This entry was posted in Slice of Life, TV/Movies on August 15, 2014 by gordonglantz. Your Poppy was quite a guy. I would like to have heard his distinctive laughter. That detail drew me in to your piece. Robin Williams, too, was quite a guy in his own unique way. What very different careers these guys had.